A little crag with some pleasant easy routes. A nice spot on a summer's evening. Rock is similar to that on Punk Rock and ML3. History is uncertain. Mike Peat (re)discovered this spot in 2007, and developed it with Tom Wilson. 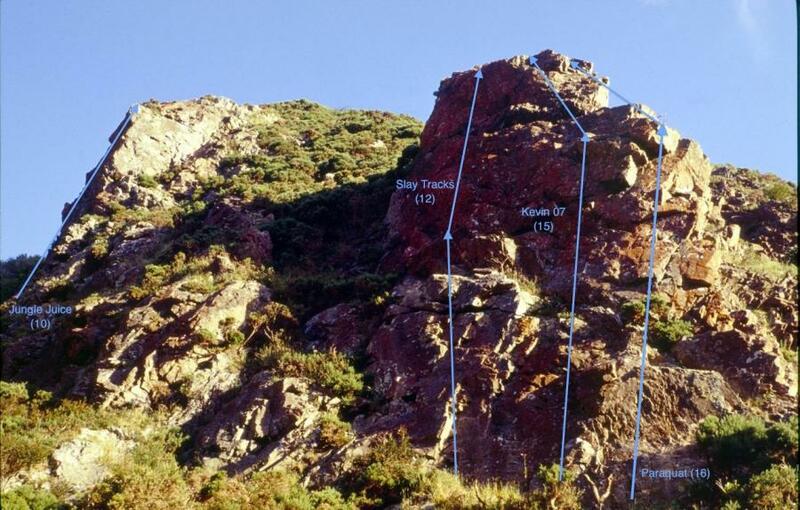 The amount of loose material removed at that time suggested that previous climbing had been unlikely. However it's possible this could be one of the "worthless crags" originally described in Jon Rosemergy's 1995 Wellington Rock guidebook. Corrections welcome. Tom put up "Kevin 07" and Mike did the rest. Mike's route names tbc. From the top of Vasanta Avenue, Ngaio, walk up the streamway. The route takes you up one small waterfall, and then to the base of a larger and impassable waterfall. At this point cut up the bank on the true right to bypass the waterfall. The crag is a few minutes further on, just past the tree line. Big wires and cams. Double bolt anchor. Pleasant climbing. Medium to large cams and wires. Shares a double bolt anchor with Kevin 07 and Paraquat. Up the middle. Single bolt just under the small overhang. Cams and wires for the rest. Shares double bolt anchor with Slay Tracks and Paraquat. Work the angles up right edge of the crag. Single bolt just before crux at arete. Cams and wires for the rest. Shares a double bolt anchor with Slay Tracks and Kevin 07.